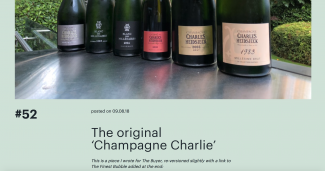 Renowned wine presenter and journalist David Kermode attended our Charles Heidsieck Dinner at Frederick’s last week to learn all about the quiet revolution happening at this once-legendary champagne house and taste a range of new and old vintages. Our host, Director of Charles Heidsieck Stephen Leroux, expertly guided guests through a tasting which included the brand new Charles Heidsieck Blanc de Blancs NV and Charles Heidsieck Brut Millésime 1983 Magnum. Read David Kermode’s full report published on his website Vinousaurus here.